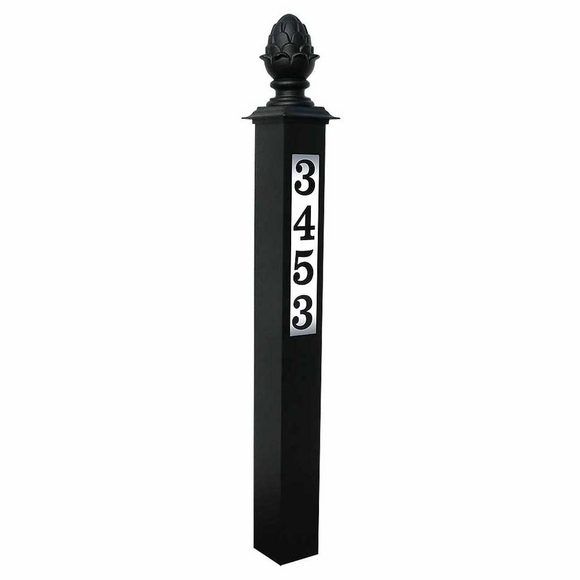 Lighted Address Post - - hardwired LED lighted address post with decorative finial. This product requires a hardwired electric source and includes a low-voltage transformer. Your house number will be clearly visible from the street day and night. Four finial shapes: pineapple, large ball, urn, and pyramid. 4" square post made of black powder-coated aluminum with one acrylic lens. Dimensions: 4" x 4" x 48"H; weighs 10 pounds. Illuminated lens dimensions: 12"H x 2.75"W.
Upgrade your lawn with a 4x4 metal post that houses an integrated LED lighted house number sign.